What do these words have in common: Sparks, Triage and Truly? I began the month discussing the idea of tracking the things in my life that Spark my interest and to notice Sparks of joy in my daily life. Then a week later I wrote about the concept of Triage, in the words of Ellen Goodman: “Triage what you want to do and what you want to quit…” Yesterday, taking off from a Nietzsche quote, I began considering “…what [I] have Truly loved thus far” in my life. Early this morning it occurred to me that the three topics are of a piece. At this point in my life, when I have definitely entered the autumnal phase, I am choosing joy over struggle, pleasure over industry, serenity over angst. That does not mean that struggle, industry and angst will have no place in my life over the ensuing years. Of course they will. But I am choosing to focus on the upside. Yes, I could have chosen to focus more on the light and joy in my life over the past 60+ years. And believe me, I have tried. But there were a few cards that were dealt in my original ‘hand’ that were difficult to discard, if I may be allowed to pulverize that metaphor. I did my best, trying to remember to look for the bright spots and I did survive with some pretty happy memories among the more troubling ones. So I was looking for Sparks all along. It took me a while to wake up to the fact that I did not have to keep playing out the same hand, or to shift metaphors mid-stream, to stick to the same script, year after year, job after job, and in every human interaction. I think my issues were primarily my attitude toward myself (questioning my worthiness) and the belief that it was my preordained role to take care of others. Once I was able to even imagine disassembling those traps and cages, I could approach the idea of Triage. However, Triage, an alluring idea, seemed beyond me. I didn’t have a clue how or where to begin. No wait, that’s not true, I was able to begin with the things that I wanted to quit. Not that it was easy to change lifelong behavior patterns, but it was profoundly obvious that there were a few things I had to quit doing if I wanted to have a decent quality of life. That process is underway and although I frequently regress, the discomfort of doing the things I have decided to quit generally forces me back onto the path of change. 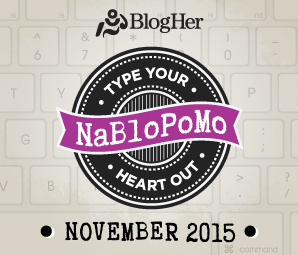 This entry was posted in Creativity, Writing and tagged NaBloPoMo 2015 by Assembling a Cooking Life. Bookmark the permalink.